If you pay any attention to the food world then you are probably aware of GQ food critic Alan Richman’s review of the upscale diner M. Wells. 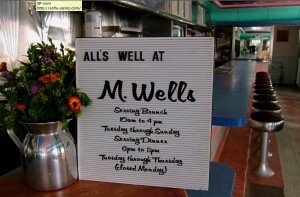 If you don’t follow food, M. Wells is a hot-spot diner in Long Island City, Queens. The diner is run by a husband and wife team, the husband being a well-respected chef in his native Quebec. Bon Appetit recently named the restaurant one of the best new restaurants in America, but due to issues involving the rent agreement the restaurant will be closing at the end of the month. The owners are already looking for new locations in Long Island City to reopen their restaurant. To be 100% clear, I have not eaten at M. Wells. All is not well at M. Wells. Sadly I was not the first person to say this today. As you can imagine the food world is buzz buzz buzzing away, so here are a few links: SeriousEats, NYMagazine, NYTimes, and HuffPo. If you want more, just Google it. The comments on all of these articles indicate a general agreement that service at M. Wells is slow. Not many people are touching upon the sexual harassment thing, which is probably for the best. Here in the South, things move a bit more slowly but people are more polite. I can’t ever recall having truly atrocious service while living in the Triangle area. I have also been fortunate in my restaurant choices in New York City. Maybe I’m more forgiving, or maybe the bad cases were just so bad that I block them from my memory. I do stand by the belief that good food is more important than good service, but that bad service can absolutely destroy a good meal. Still, there are restaurants with slower or more negligent service that I will frequent because their food is so good. I also know to avoid certain establishments on certain nights (Milltown in Carrboro during the weekends stands out in my mind for this, Jon and I waited forty-five minutes for someone to take our food order on our second date, I guess that was a good test for compatibility) because the service is like molasses. I do believe that our attitude toward tipping guilt trips us into over-tipping. For instance, I typically tip 15-20% regardless of the service. However, it should be perfectly within my right for me to tip lower on service that I find abhorrent. But no, that would be poor form and it also deprives already underpaid service workers of much-needed tips. I think in the future, when faced with incredibly awful service, I’ll just swallow my guilt and tip lower. It might encourage the waiter or waitress to be a bit more polite, friendly, or on their toes. Maybe I sound entitled, but I do believe that dining out, casual or not, is an experience, and that experience involves a certain level of friendliness and hospitality. So what about y’all? What do you think of the Alan Richman M. Wells “scandal”? And let’s leave the sexual harassment thing out of it, that’s a really bizarre sideplot and I don’t think that Alan Richman would tell that story if he had actually groped a waitress. What do you think about the current state of service in restaurants? Too casual? Not casual enough? Or would you rather just eat at home and not worry about it?